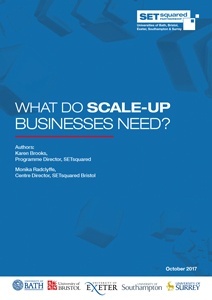 The Scale-Up Institute defines a ‘scale-up’ company as having more than 10 employees, with average growth in employees or turnover greater than 20% per annum over a three-year period. Here at Bristol, we have some fantastic examples of SETsquared incubated start-ups, which have gone on to see growth in excess of this, with some of reporting 40 – 100% year on year growth over the last three years. Alumni company Ultrahaptics, world leaders in mid-air haptics technology, earlier this year announced a series B investment of £17.9m which will support the company through its global expansion – is just one example of the growth and rapid scale-up we’re seeing. We recently embarked on a research project to find out exactly what support scale-up companies really need. The research was via structured interviews with 26 companies and explored challenges they face as scale-ups and what help could or would have been helpful during that phase. The research highlighted that too often the support offered to scale-ups was generic or too resource-intensive to make it worth their while engaging. Some of the key areas for support needed included access to high-quality mentors, understanding overseas export markets, being investor ready and the problems associated with manufacturing on a global scale. SETsquared Connect: a networking event at which we always feature an alumni founder story tackling different topics such as recruitment, company acquisition or raising investment, to ensure that their knowledge and experience flows back to our incubated start-ups. Workshops: this helps keep the alumni community engaged with us and whilst founding teams don’t always have time to engage with lots of events, they often act as good training options for their members of staff. Twice yearly Founders Forum: founders need to engage with other founders to share ideas, knowledge and challenges and this event brings them together confidentially for peer to peer advice. The announcement from HEFCE that the SETsquared Partnership has successfully secured funding of almost £5m under their Connecting Capability Fund was extremely welcome and means we can provide additional services to help companies scale-up within critical sectors. In summary, providing the right type of business support to scale-up companies at the right time is essential, in order to boost their international competitiveness, productivity, investment success and growth – to keep our economy thriving. SETsquared in Bristol will always be committed to nurturing technology start-ups and scale-ups as it’s vital to foster the commercialisation of new technologies which will help solve societal and environmental problems now and in the future but this new funding will enable us to make our business support services available to the businesses that will deliver the long-term growth for the UK. In the West of England, Engine Shed, the home to SETsquared Bristol, has been working on developing the wider Scale Up ecosystem: mapping what exists in the ecosystem, identifying the gaps and starting to initiate activities to enhance the environment for scale ups, emerging from SETsquared or other programmes, to thrive.